Route4Me’s route planning engine requires users to input their data into the system for processing it and outputting the most efficient and optimized routes. Uploading spreadsheets is the fastest and the most effective method to get you started planning your routes. A spreadsheet file is made of organized rows and columns. Spreadsheets can be exported from other sources, or they can be created using Microsoft Excel, Google Sheets, OpenOffice Calc and other similar pieces of software. Route4Me currently supports CSV, XLS and XLSX files for upload. For the most accurate results, we recommend using spreadsheets in CSV format. Route4Me supports spreadsheet files containing addresses and the data associated with various fixed attributes that are assigned to the corresponding addresses. Route4Me also allows you to import custom data that can be added to the corresponding sections of the system. Please note that Route4Me’s uploader does not support spreadsheet files containing macros, formulas or filters. 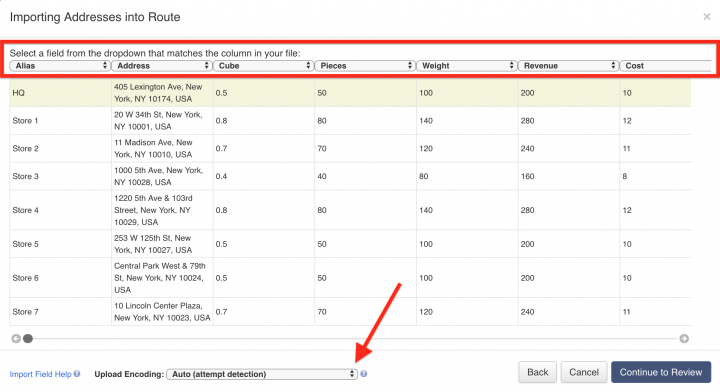 If your file contains multiple sheets, the system will prompt you to select only one sheet for the upload. For a spreadsheet to be successfully uploaded and processed, it must contain a header row and data rows. The header defines the type of information you are adding, while the corresponding data rows contain the actual information you input into the system. – Custom columns are the columns where you can include additional data that is not encompassed within the list of reserved attributes. Custom columns are processed by the system and added to the Custom Data sections of the associated addresses. The only mandatory column is the “Address” column, where you should include: the street name and number, city, state and zip code. Alternatively, you can only input the street name and number into the “Address” column, then enter separate columns for the city, state and zip code. The address format may differ from one country to another, so make sure that you write it in the manner that’s specific to your region. To upload a spreadsheet, first, prepare the file in accordance with the requirements mentioned above. Please see the list of all available Route4Me reserved attributes in the Spreadsheet Glossary below. When a spreadsheet is uploaded, Route4Me processes the data and displays it in the corresponding window. For the system to process the data automatically, select the “Auto (attempt detection)” option. Once the file is uploaded and processed, the imported data is added to the “Order” sections of the associated addresses/stops on the route. You can add columns with various reserved attributes to meet your routing and business needs. The Spreadsheet Glossary provides a detailed list of all supported attributes. Please make sure that the column header you add to your spreadsheet files matches one of the valid reserved attributes in the table below. Click on the links below to download sample spreadsheet files. – Uploading data to the Address book: maximum 10,000 rows / addresses (recommended: 1,000 rows).